….The Times They Are A' Changin'! 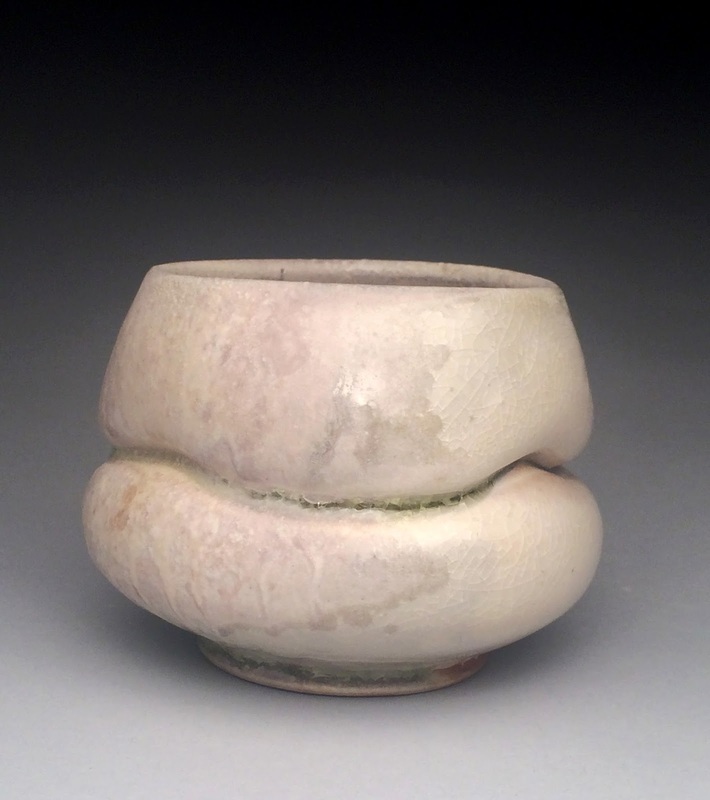 …some small yunomi destined for the Watershed Center for Ceramic Art's Salad Days Invitational. 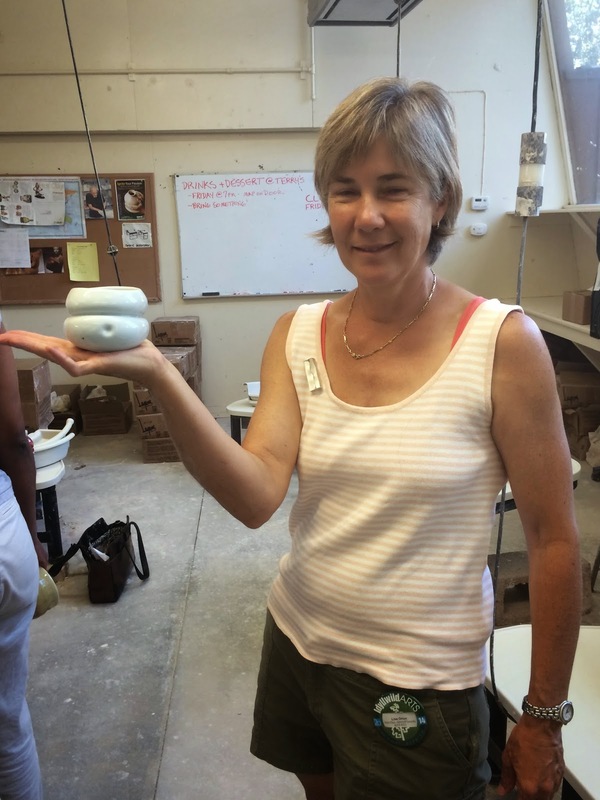 So…….. in a recent turn of events, I am pleased to announce that I will begin a new tacking position this fall as an Assistant Professor of Ceramics at Jacksonville State University, in Jacksonville, AL. I must admit, it came as a bit of a surprise, but I am excited to be joining a really dynamic little art department in the foothills of the Appalachian Mountains, about an hour outside of Birmingham and an hour and a half from Atlanta. Of course, I have a lot of mixed feelings about leaving New Orleans, which has been my home for the past 10 years, along with the friends and loved ones who are like family to me. The miracle that is Google Maps suggests that I can make the drive in around 6 hours, but any human with any bit of weight on their right foot and a decent amount of caffeine can do it in 5 1/2 …(maybe slightly less). I bring this up because, at least for the first semester or so, I plan to be in New Orleans a lot, if not every weekend. There are some loose ends I need to tie up here, studio wise, and my partner of 6 years and her cat will be staying in the city, at least for the immediate future, due to a recent new job. It would seem that Timing is never quite right when it comes to the important things! But, like I mentioned, I'll be "commuting" back and forth and a nearly weekly basis, so long as my car and my back hold out, and I'm easy to get in touch with. 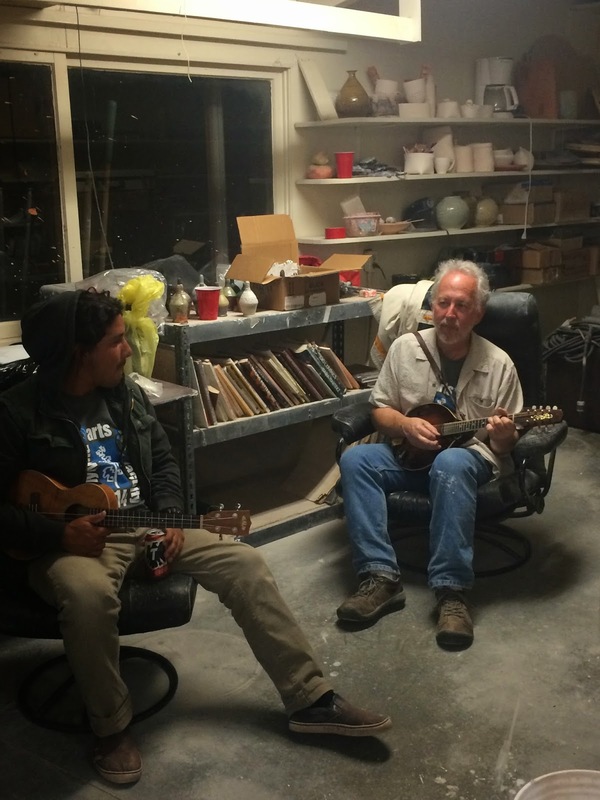 I'll also be keeping my studio space in New Orleans, at least till the beginning of 2016. Mostly because no one wants to move out of a tin roof attic studio during the summer months in New Orleans….and, because I'm a softy and get very sentimental about leaving it. Currently, there are three other young ceramic artists sharing space up there, and I hope that they will continue to do so…..I'd hate to see the place empty! These last few pots are also from a recent firing. They're slated to be packed and shipped up to Maine for the Invitational Pottery Sale that happens on July 11th during the Salad Days fundraiser at the Watershed Center for Ceramic Arts. If you've never been to Watershed, you really should! 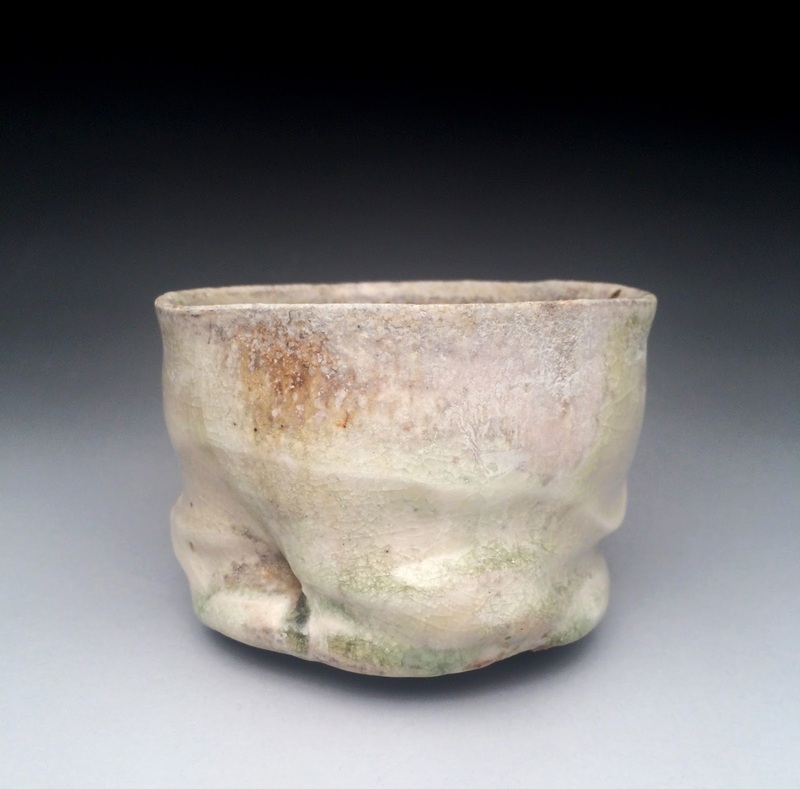 ……pale green celadon tea bowl. Over the weekend, I had greatest time teaching a Visiting Artist workshop at the Ohr- O'Keefe Museum in Biloxi, Mississippi. 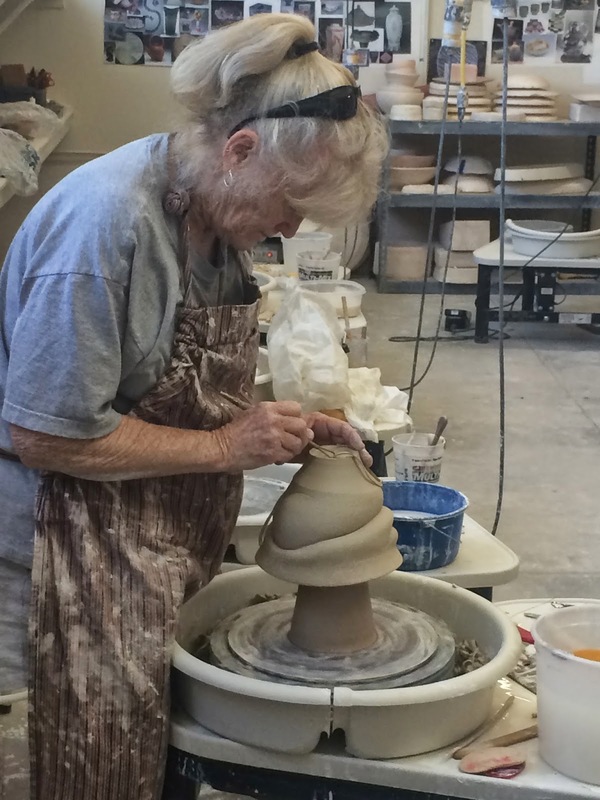 Built to house and exhibit the collection of pots from, arguably, the most eccentric figure in American Ceramic history, the Ohr- O'Keefe museum is one of the best kept secrets along the Gulf Coast. The architect Frank Gehry designed the modern structures that were completed just prior to being devastated by Hurricane Katrina, and it took many years before the reconstruction was completed. In addition to the museum galleries, there is a gorgeous teaching/workspace (it's in the building that's just off to the left in the photo above) that features glass roll up doors that open up in nice weather onto a courtyard and another glaze/kiln area. Really, you have to see the space to fully appreciate it! Anywhere else in the country, there would be a years- long waiting list to rent studio space or do a residency in a facility like this one! The courtyard has a retaining wall the faces the beach and is the perfect place to dry pots or sit and enjoy an early evening beverage after a long day of pottin'. ...student pots enjoying the view! 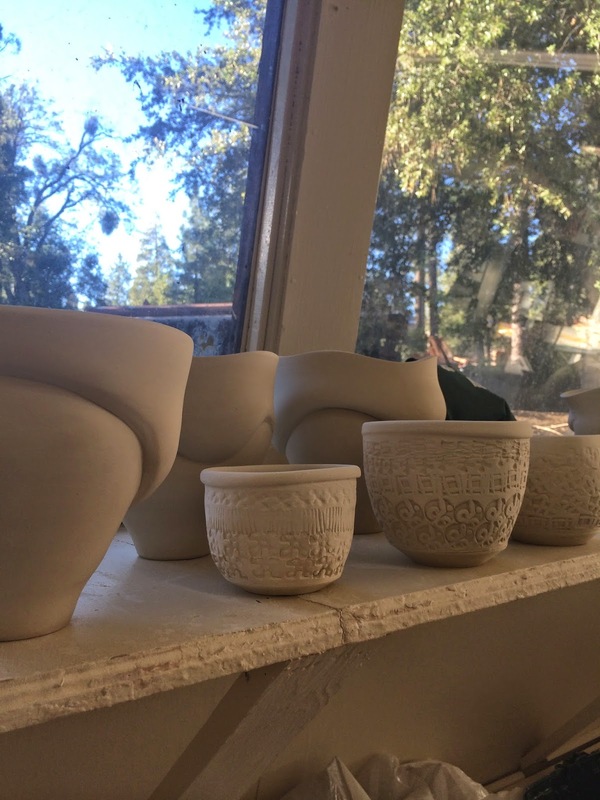 I was really fortunate to have such a great group of potters show up for 2 days of (mostly) hands- on work with porcelain, which is my material of choice for about 99% of my forms. 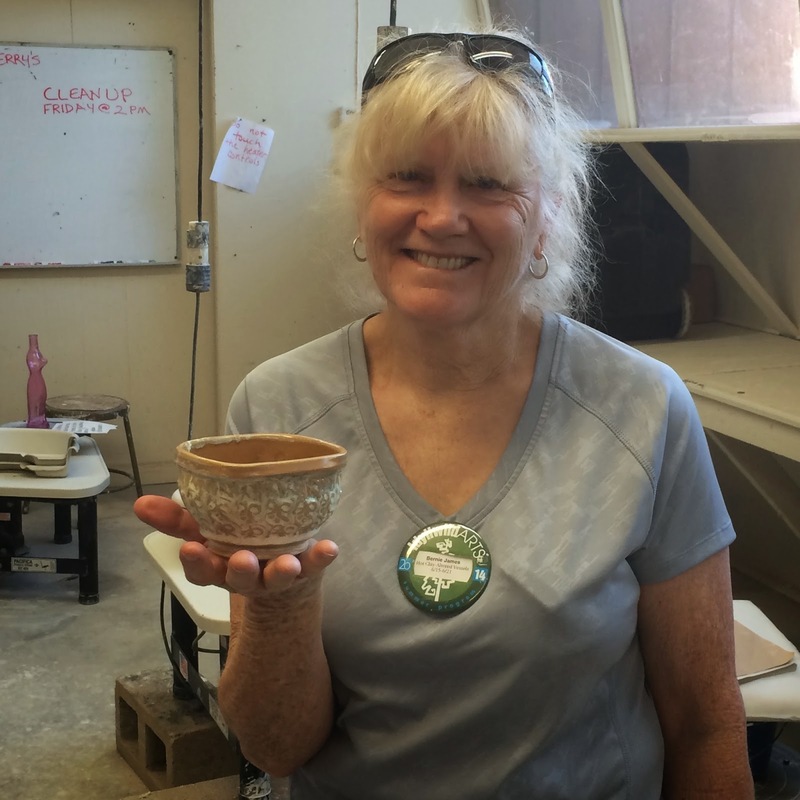 We began with a Saturday morning Throwing and Altering demo for a few hours, then everyone wedged up some porcelain and got to work! After such a cold (by Gulf Coast standards) week or two of weather, we were blessed with warm sun and clear skies that made drying the work much easier. This is essential in a short workshop like this one, and it was our intention to be able to get everything trimmed and finished by the end of the day on Sunday. As it turned out, we actually got to squeeze in some throwing time on sunday morning, with a lot of pots drying on the wall outside ready to be trimmed after lunch. ...hard at work experimenting with new forms. Truly, these workshops have become my favorite teaching environment, especially when we all get to make work together. Stacey Johnson, the Director of Education and my host for the weekend, went above and beyond the call of duty to make sure everything went smoothly and everyone was well fed! We hit it off immediately and, as it turns out, Stacey has a long history with New Orleans and was a student with my former studio mate W. Steve Rucker at Loyola University (also my former place of employment). Usually when I do this kind of thing, I mostly focus on my altered bowl forms, as they make for probably a more interesting conversation than some of my other work, and it's the work that I'm most comfortable demonstrating in front of a crowd while still attempting to provide some sort of dialogue to keep people awake. I've been on the other side of the wheel too many times watching someone demonstrate their beautiful technique in awkward silence for the better part of three hours and I promised myself that I would try as hard as possible to not be that guy.....sometimes it works.......but, ...........other times... ;) .......well, you still gotta trim! ......getting centered is half the battle! As an added bonus, it always rekindles my interest in these forms that, for a while, I was not sure if I would ever want to make again. Back around 2011, these altered bowls had become so familiar to me and it was practically all that I was producing for the previous 3 or 4 years, so I guess I needed a break!.. Fortunately, the familiar often has enough subtlety to invite you back to reexamine the forms, and I look forward to returning to my studio and making a new series of these altered bowls. ...these were a few "practice bowls" made in my own studio, prior to coming out here. If there was one tiny set back, it would be that the digital projector and laptop computer setup was not being very cooperative and, as a result, I was unable to give my usual presentation. Now, depending on who you ask, this could be for the better! ...But, I enjoy doing it and I think it's fun to show images of your artwork to people and talk about the way it's slowly evolved over the years. And, ...if that happens to be you, let me extend a sincere "Thank You" for spending the weekend with me. I enjoyed getting to know each one of you and I'm certain our paths will cross again! Clay is a Small World! ...black fired stoneware and porcelain assemblage, riffing on the "Cup and Saucer" theme. ...thrown and slab built porcelain Bowl and Stand. containers...while others exist as purely sculptural studies. I've also begun posting images at Instagram under the user name john_oles. I figured it was about time to shake my aversion to technology and, truthfully, it's a lot more convenient to post images directly from my iPhone. ....celadon porcelain vase, ..hand built..
....porcelain and black fired stoneware.... December, 2013. One of my favorite things about making this work is in the process of working reductively with the material, as opposed to always building volume from the inside, as you would with pieces that were begun on the wheel. Much like wheel throwing, this reductive sculptural process exploits many of clays inherent properties that make it a fascinating material. ...porcelain and black fired stoneware.. Recently, I've taken a teaching position at Delgado Community College here in New Orleans and, while it's been a busy few months of adjusting to a new studio and teaching schedule, I've fortunately been able to make a lot of work. This is important, not only for sanity sake, but to fulfill my obligations to two important (albeit very different) shows I had lined up this fall. the first was an exhibition with the photographer Mika Fowler at Jacksonville University in Florida. They just completed construction on a beautiful new gallery space and we we the inaugural exhibition. The title was Engaging Form, and it was really interesting to see how our work complimented each other in the context of interpreting. The following images are just some quick shots with my iPhone camera. 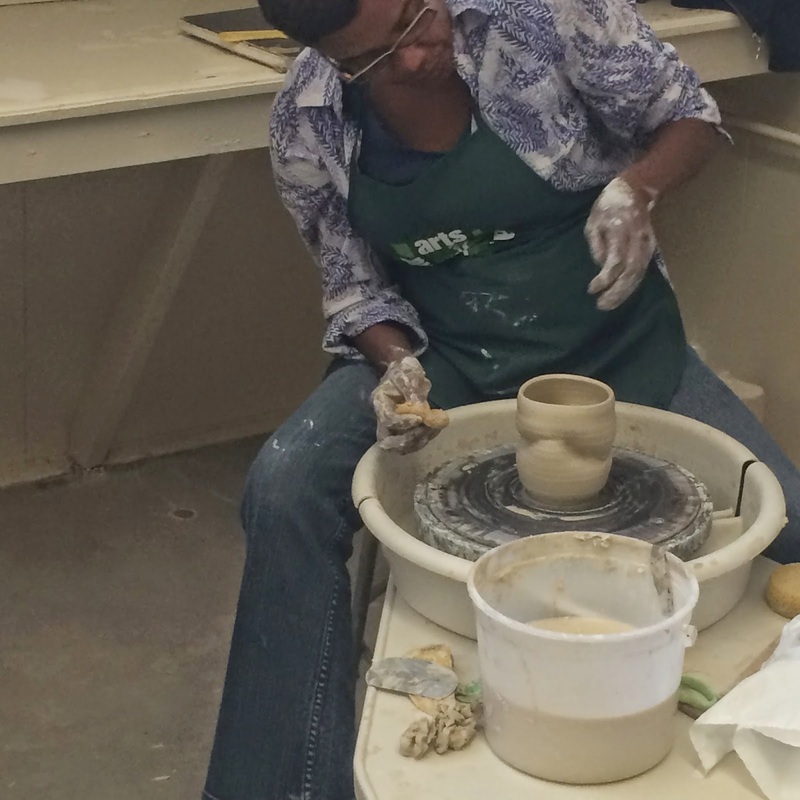 This week in Jacksonville included demo's with the students from Dana Chapman Tupa and Tiffany Leach's Ceramics I and II classes, as well as individual critiques with the Senior BFA students. All of this was capped of with a Friends of the Arts hands- on workshop called (appropriately) Vodka and Vases, which was catered and featured vodka- based cocktails for the participants....to aid in the wheel throwing process, naturally! Anyhow, I decided that, regardless of whether or not i sold any work, it would be a learning experience. Now, my pots aren't really at home on a folding table under an Easy Up tent....they tend to be small and white (or pale celadon blue) and I really wanted to try to display them in context. Usually, this context is in someone's home or in a gallery. So, the display that I constructed was more about presenting the work in such a way that it was visually engaging and might help to make sense of these semi functional/semi sculptural objects to an audience who may or may not be familiar with much contemporary studio ceramics. Here are a few shots of the folding wall sections with added scavenged wood shelves......sort of going for a rustic/contemporary feel. They're all stained in a Dark Cherry, with shelves in a slightly darker Kona, to really make the light colored pots "sing". ...celadon whiskey cups on a shelf. Like I said, it was supposed to be a learning experience, and I certainly leaned some stuff! First off, I may or may not be exactly cut out for this kind of thing....we'll see. The work sold pretty well, but not great. It was quite different from what people had come to expect from the show and, while it received a lot of positive attention, that didn't always translate into sales. But it was enjoyable talking with people and getting their reaction to the pots....(yes, you can really drink out of these...) And, the folks who did buy them were very interested and appreciative of the quality and subtle nuances of porcelain. It was also a good chance to refine some glazes and work on a few new forms like these little round sake cups and yunomi with a sugary white glaze that I've been struggling to get right for many years. It will be good to get back ino the studio and start working on some higher end, individual pieces for the upcoming NCECA conference in Providence this March. I was fortunate to be in a couple of high profile exhibitions that I'll tell you all more about as it gets closer to the new year but, for now, ....off to class! 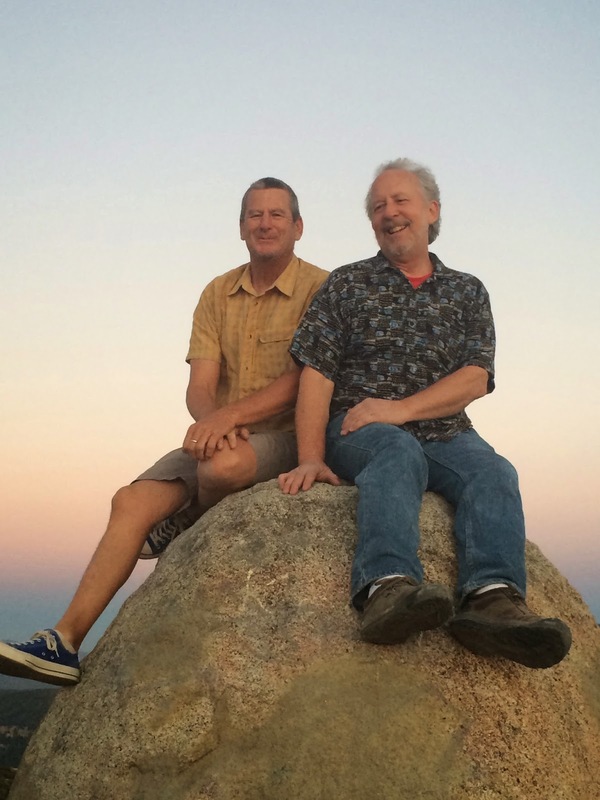 As I look for the silver lining in all of this, I tell myself that, at least, I'll have more time to write (here and other places) and more time in the studio to work. And, while this sounds great in theory, my bank account is less than cooperative when it comes to trying not to bleed out money every month. I've always appreciated the interaction of group workshops that extended beyond the usual 1-2 day Visiting Artist lecture and demo, and this past week was really special. We had an almost full class of 9 students, most of whom were a bit older than the post- BFA demographic that I'm accustom to teaching. 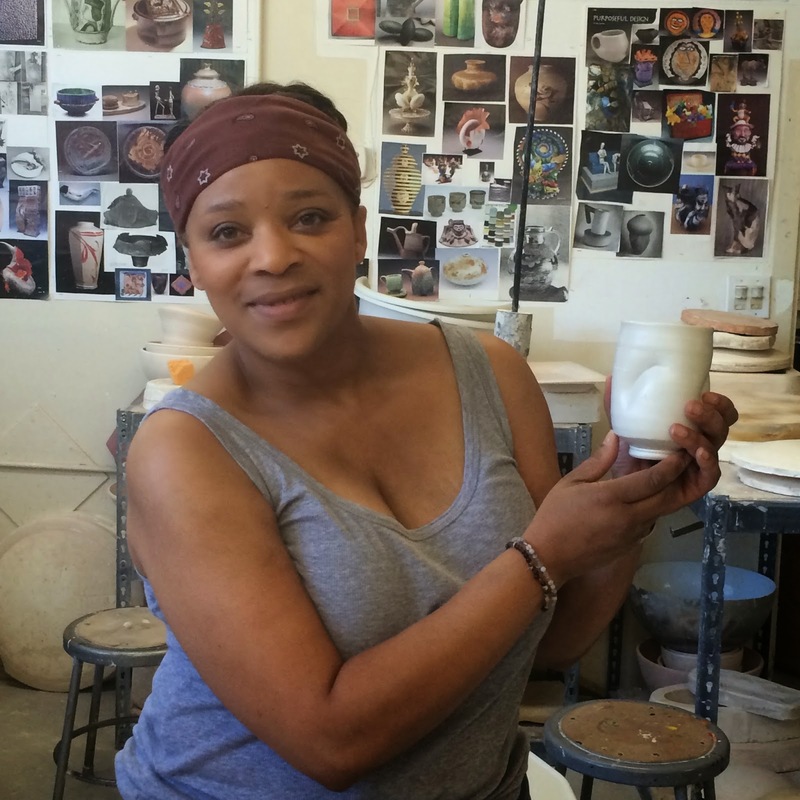 And, after an intense 3 days of working in the studio in preparation for a mid- week bisque firing, I gotta say that these folks really brought their "A Game" and made some fantastic work!!!.. When you look at it, it's really amazing at what you can accomplish when all you have to think about is working in the studio for three or four solid days without silly things like work or laundry or cooking to get in the way. Honestly, if my cat was reincarnated as a potter, I'm sure this is pretty close to what her life would be like: Wake up, Eat, Make pots, Eat lunch, Make pots, Nap, Eat Dinner, Make Pots, Drink, Sleep.....repeat. (Actually, if you substituted "make pots" for "sleep" this is pretty much her schedule, to the dime). And the result of all that intensity is that you have a pretty good body of work to fire and glaze by the end of the week, which we did, using mostly my glazes. 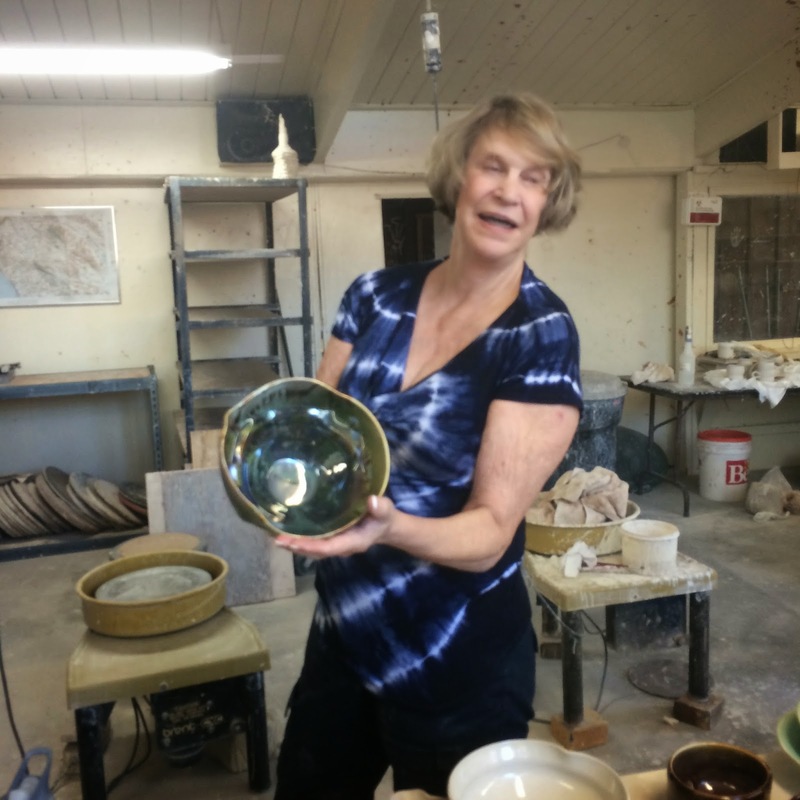 I say "my glazes" but, in all honesty, they're just the glazes I use on my personal work and the recipes have been pilfered or given to me, over the years, by other potters. I give the recipes out freely and I truly believe that you should, too. Yes, ...even you. ...fiber kiln full of pots for a cone 10 glaze firing..
Also, I always try to keep the original names or, at least, the names that they had when I stole them...*ahem*...I mean, "appropriated" them, because I believe it's important to give credit where credit's due. Many of my buckets, like probably many of yours, start out with the letters "V.C" for "Val Cushing". Then there's a "Coleman" and a "Binn's" (Charles Fergus...to be exact) and one more with the name "Hennessy" whose origins are unknown to me,..... but I like to think it relates to the cognac. 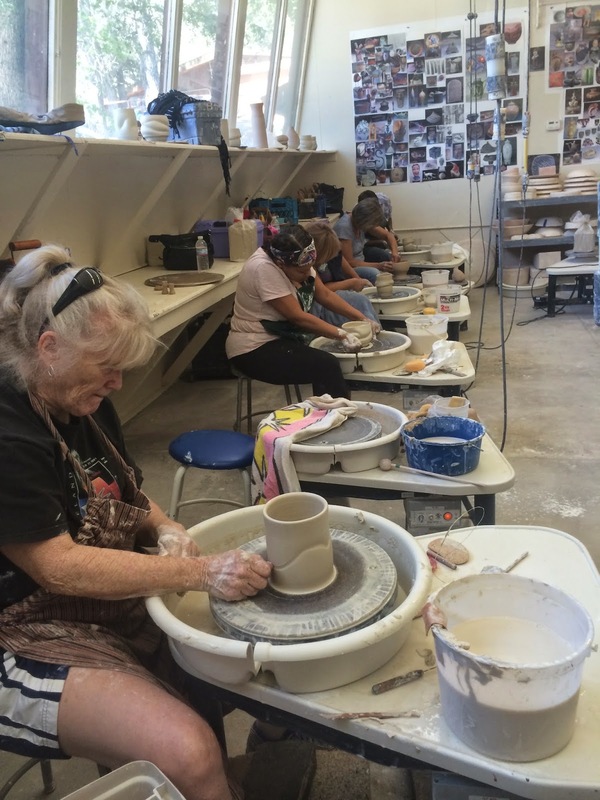 While I was teaching in one of the studios, Patti Warashina was teaching a figurative sculpture class next door and Michael Corney was teaching people the nuances of painting on pots in the studio across the road. 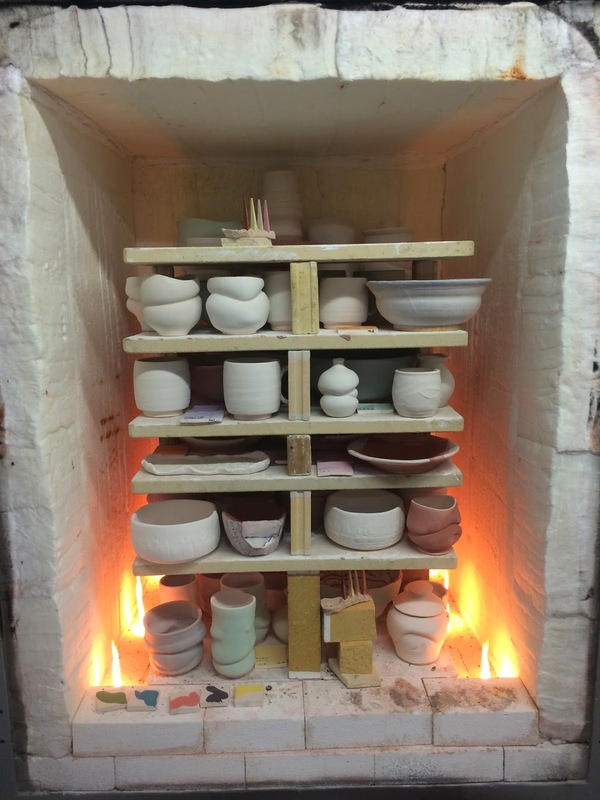 Add to that, Richard Burkett was making pots in preparation for his workshop next week on cone 6 glazes, so we had a full house and the benefit of many years of experience to draw from. 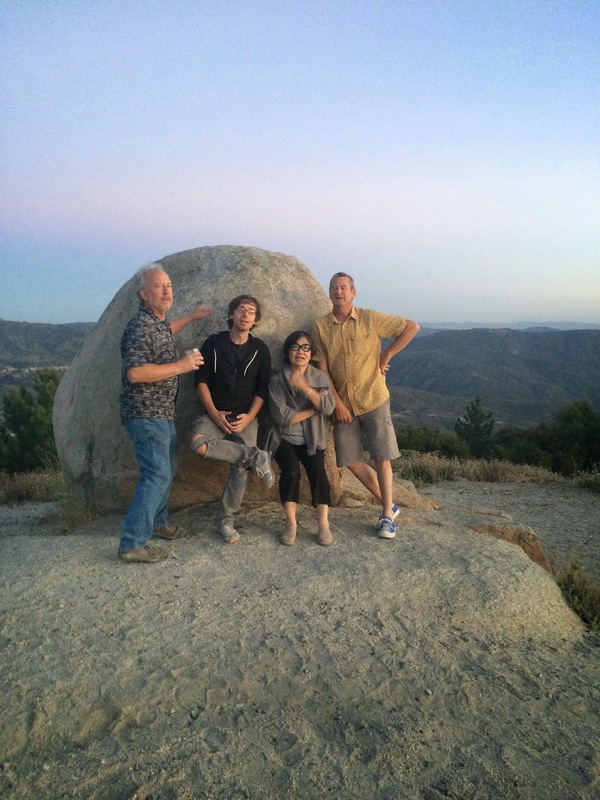 ...Richard Burkett, me, Patti Warashina and Michael Corney..
...Michael and Richard at sunset..
...studio music provided by Richard on mandolin and Sam on Ukelele..
...not a bad firing from a fiber kiln. It cooled really quick but we still got some nice buttery matte surfaces. 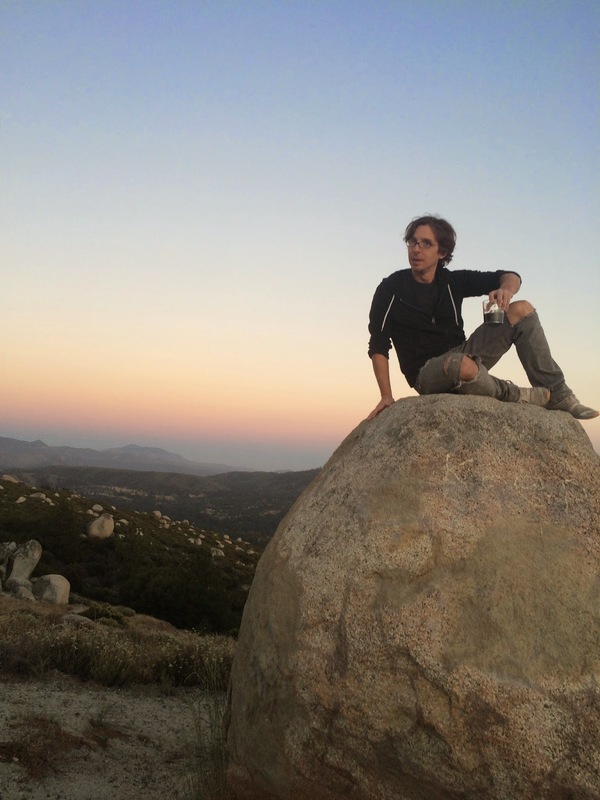 So, here's one of me drinking wine on a rock. It kinda sums up this wonderful experience and a huge "Thank You!!!!!" to everyone who participated. I hope our paths cross again! I've finally gotten around to photographing some of the pots from last month's woodfiring. As always, some things go in the kiln good and come out horrible, while others go in " just ok" and come out magical. This was a particularly good firing with a lot of natural ash build up. 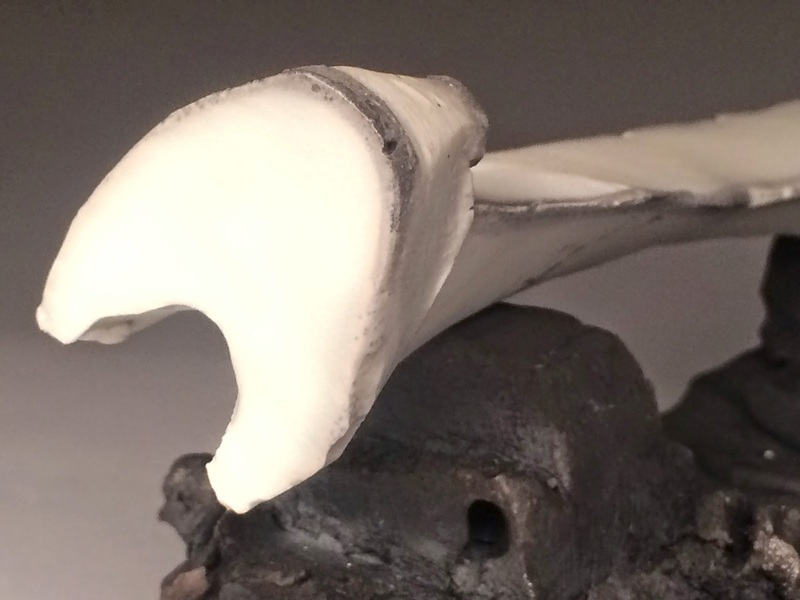 It also gave me a chance to work with some new clay bodies, mostly stoneware and a Helmar- based porcelain that were both a refreshing alternative to the stark white Grolleg porcelain that I use in 95% of my reduction fired work. I'm not really known for making wood fired pots, and I suspect no one would think of me a a wood kiln potter. 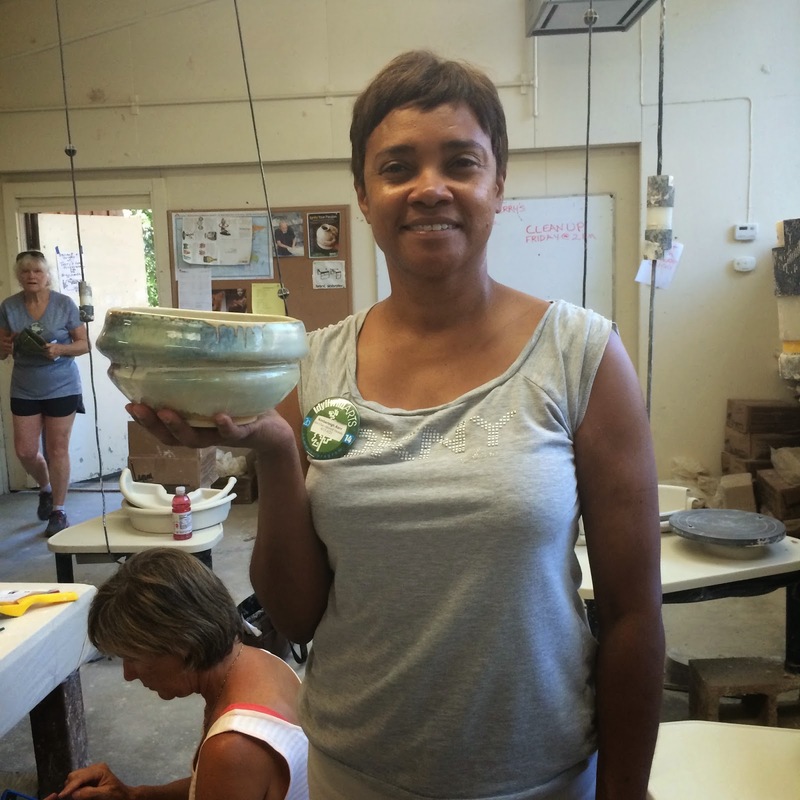 But for me, wood firing is like going on "ceramics vacation". I get to get out of my studio and spend time with some good people, and I get to play with looser forms than usual. Sometimes the wood fire aesthetic can be a bit overwhelming for my tighter, more controlled forms so I like to go into it knowing that I will allow myself to make looser, less refined pots that will (hopefully) benefit from effects of the kiln. 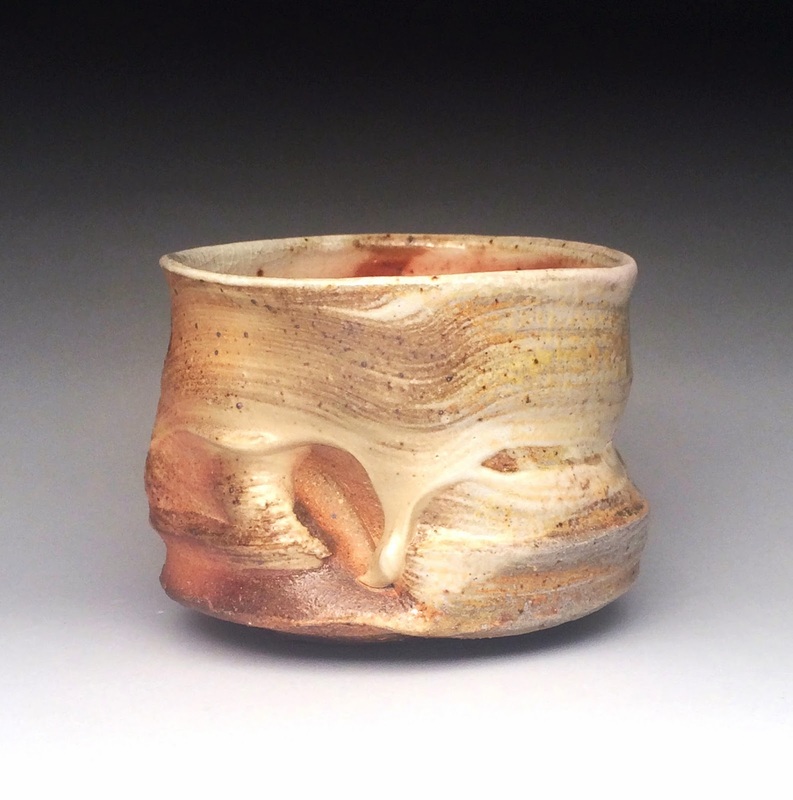 ...here's that new Helmar porcelain body with a shino glaze. ...some beautiful ash build up on a fish scale glaze. Shino's poetic. It changes in almost every firing and captures the natural ash from the firing while recording the passage of the flame throughout the kiln. 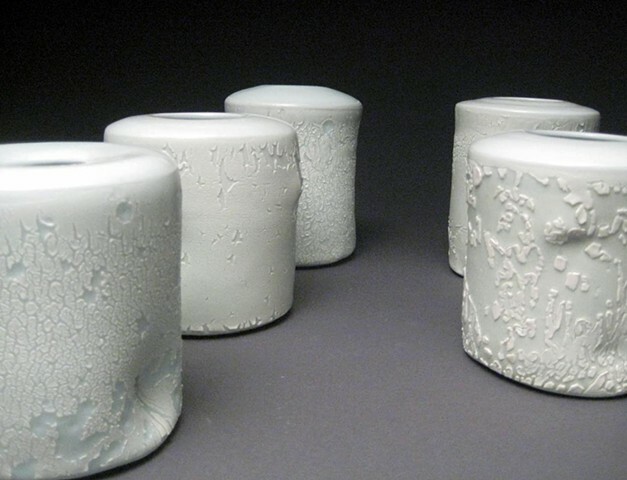 As a glaze, it will even change over time in its bucket, as water evaporates and soluble soda ash crystallizes. It's reliable, doesn't run, and welcomes "accidents" like finger marks or drips. This particular recipe looks good on stoneware and certain porcelains containing kaolin that is less "pure" than Grolleg and such. On my Grolleg- based porcelain, it tends to look a bit bland. And, here's few shots of the crew, for good measure. It's been a good 3 years of firing with my friend, Jeff Brown, who teaches ceramics down in Thibodeaux, LA, at Nichols State University. This place has been, at one time or another, home to such ceramics legends as Joe Bova, Dennis Siporski, and Bill Krehmer. And now, Jeff Brown. I'm always thankful for the invite. 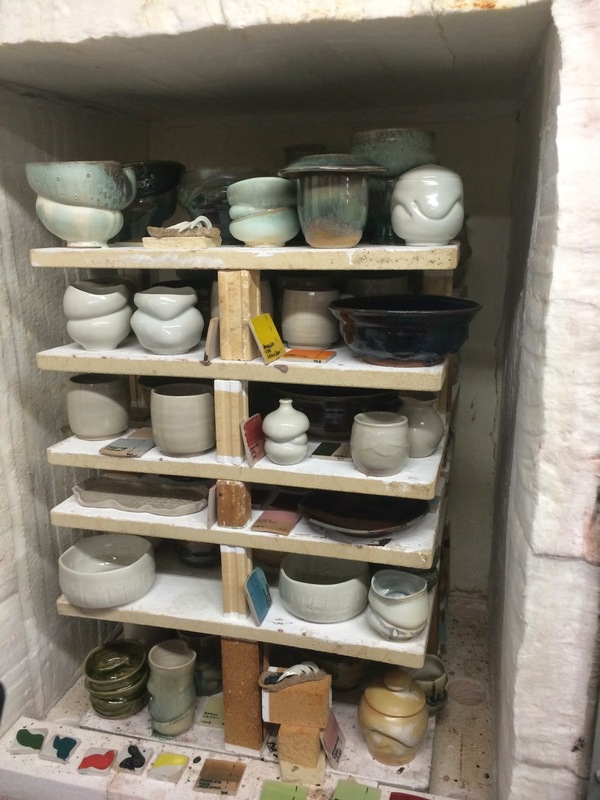 ...Jeff Brown loading the kiln. ....and me. My back is not as young as it used to be! This last piece is not from the wood firing, but I wanted to include it to show the marked contrast in feeling that one gets by comparing this to the warm browns and oranges of the wood fired pots. This cool, meditative celadon glaze has not fared too well for me in the wood kiln, although I know some people's recipe's do. I prefer to keep this for my gas fired work, as it really sings on a clean, brilliant white porcelain. That reminds me, I have a kiln firing right now that I should go check on! 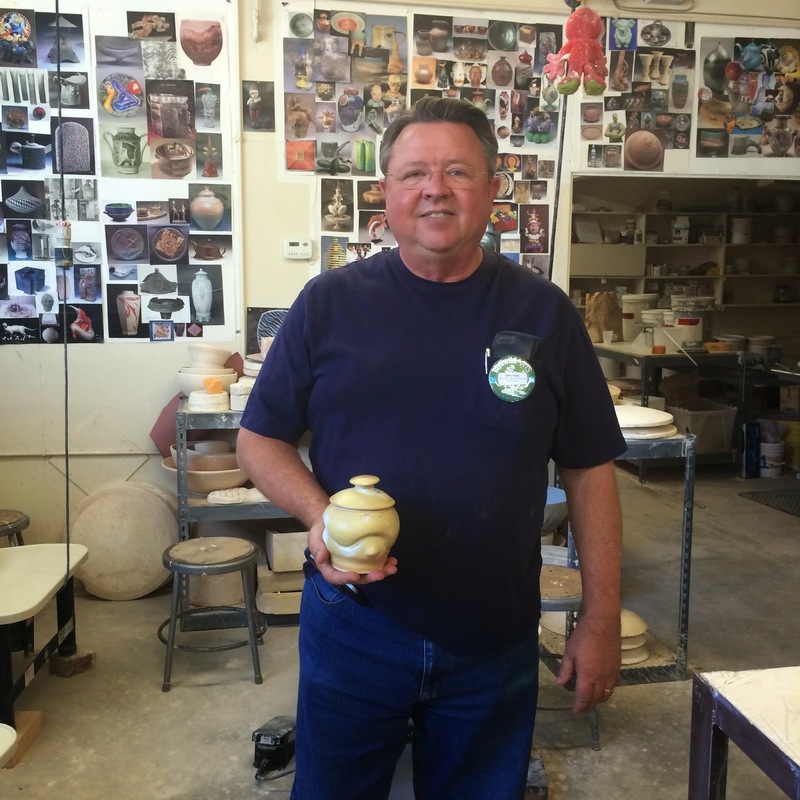 Hopefully, it will yield a few beauties to send to the Santa Fe Clay La Mesa exhibit at this year's NCECA conference.